It seems that a nasal spray with a mixture of beneficial bacteria may ultimately work the best because the bacterial diversity of the sinus microbiome is depleted in persons with chronic sinusitis, and there is "enrichment of sinus pathogens" (bacteria that can cause disease). As I've mentioned in other posts, S.V. Lynch is involved in developing a nasal probiotic spray containing L. sakei and other Lactobacillus species to treat sinusitis, but it is unknown when that will be available. The authors also made the point that probiotics (beneficial bacteria) may work several ways in the sinus microbiome (a community of microbes living in the sinuses). This "niche" with its own ecosystem or community of species can be altered, with some bacteria species wiped out, perhaps by illness and/or repeated courses of antibiotics. Therefore, think of the different microbial species in the sinus microbiome as having different functions: as a keystone (a species that has a very large effect on the community), pioneer (species that are the first to colonize the niche after a disruption), or dominant species found in a healthy state (species with a relatively high abundance in a niche). They also discuss what are the main pathogens found in chronic sinusitis, but they also mention that bacteria that we think of as pathogenic (the bad bacteria) are also present in healthy persons - just at a lower level than in chronic sinusitis sufferers. Also, these diverse microbial communities can vary between healthy individuals - that is, the healthy microbial communities are a little different among people. Common pathogenic bacteria found in CRS are: Staphylococcus aureus, Pseudomonas aeruginosa, Corynebacterium tuberculostearicum (normally a harmless skin bacteria), and Streptococcus species. Remember, healthy sinuses have greater bacterial diversity than sinusitis sufferers, and CRS patients have "substantial microbiome dysbiosis" (microbial communities out-of-whack), with "microbiome community collapse" and "enrichment of specific sinus pathogens". In other words, the microbial sinus communities in CRS are in bad shape and need to get good bacteria in there. For information on how some people are already successfully using probiotics such as L. sakei for sinusitis treatment, read The One Probiotic That Treats Sinusitis (products, brands, and methods). The human microbiome, i.e. the collection of microbes that live on, in and interact with the human body, is extraordinarily diverse; microbiota have been detected in every tissue of the human body interrogated to date. Resident microbiota interact extensively with immune cells and epithelia at mucosal surfaces including the airways, and chronic inflammatory and allergic respiratory disorders are associated with dysbiosis of the airway microbiome. Chronic rhinosinusitis (CRS) is a heterogeneous disease with a large socioeconomic impact, and recent studies have shown that sinus inflammation is associated with decreased sinus bacterial diversity and the concomitant enrichment of specific sinus pathogens. Similar to other chronic inflammatory diseases, including inflammatory bowel disease and asthma, evidence is emerging for the role of the sinus microbiome in defining upper airway health.....two trends in the literature are evident. First, all three studies that have examined the microbiota of healthy subjects demonstrate the presence of a diverse microbiome that includes bacterial groups classically considered as causative agents of respiratory disease, including Pseudomonas, Staphylococcus, and Streptococcus. Second, substantial sinonasal microbiome dysbiosis is associated with CRS. In one example, Abreu and colleagues demonstrated microbiome community collapse in the maxillary sinuses of CRS patients compared to healthy controls characterized by the outgrowth of Corynebacterium tuberculostearicum. In another study, nasal lavage specimens from CRS patients revealed microbiome collapse coincident with Staphylococcus enrichment. Immune responses in individuals with CRS vary considerably across patients.... While the underlying processes contributing to a patient’s immune response are not well understood, there is evidence for microbial stimulation. Staphylococcus aureus exotoxins are associated with a Th2 inflammatory response characterized by eosinophilia and enterotoxin-specific IgE , and the Th2 cytokines IL-4 and IL-13 have been associated with S. aureus outgrowth in other inflammatory diseases. Another common sinus pathogen, Pseudomonas aeruginosa, can induce antimicrobial nitric oxide production by host recognition of bacterial quorum sensing molecules through stimulation of the bitter taste receptor T2R38. There is clearly heterogeneity across patients with CRS; thus, future therapeutic microbiome manipulation strategies must be targeted to the specific microbiome perturbation and immune dysfunction of the patient. Since CRS is immunologically and microbiologically diverse, it is not surprising that current treatment strategies using corticosteroids alone or in combination with antibiotics are variably successful. Some patients recover completely without recurrence, although 10–25 % of patients require repeated treatment....Patients who do not respond to medical management are candidates for functional endoscopic sinus surgery (FESS). The goal of FESS is to remove polypoid tissue and open ostia to facilitate sinus drainage. While some patients rebuild their native, healthy microbial communities and epithelium following FESS, many patients require revision sinus surgeries. Importantly, these therapies only manage chronic airway diseases and, in many cases, do not address the underlying source of disease, e.g., dysregulated microbiota. Since it is clear that the microbiome plays a fundamental role in respiratory health, it is essential to begin to define the interaction between pathogens or pathobionts in the context of the healthy host microbiota. As discussed above, the most common route of probiotic delivery (oral) takes advantage of the GI-respiratory axis. In the only clinical trial of probiotic use in chronic rhinosinusitis, Mukerji and colleagues reported that oral administration of L. rhamnosus R0011 improved patient-reported symptoms of rhinosinusitis in the short term (<4 weeks), but not the long term (8 weeks). These results suggest a potential role for GI microbiome manipulation to affect the sinus immune response; however, there has not been a follow-up study to further elucidate this role. Repeated dosing or inoculation with mixed species could improve these results. Several variables should be considered when designing probiotics for potential treatment of sinus disease. The first consideration, the route of administration, will determine the mechanism of action of the probiotic. Oral probiotic supplements primarily affect the respiratory tract through translocation of microbial metabolites, cytokines, or immune cells to the airways via systemic circulation, while local delivery via sprays or nasal lavage will affect the sinonasal microbiota and local immune responses...This first variable, route of administration, will determine which probiotic species are used. A second consideration for probiotic development is whether to supplement with a single species or a mixed-species consortium. Single species or species mixtures can be selected based on how best to leverage the healthy microbiome. From an ecological perspective, the potential role of the probiotic(s) should be considered. For example, the specie(s) may function as keystone (a species that has a disproportionately large effect on the community), pioneer (species that are the first to colonize the niche after a disruption), or dominant species found in a healthy state (species with a relatively high abundance in a niche). Probiotic administration can influence the host-microbiome composition and function directly through production of antimicrobials, changing the pH, or through competitive colonization within a niche. Bacteriocins are antimicrobial peptides produced by bacteria with a wide range of activity, either narrow spectrum (active against similar species) or broad spectrum (active across genera). Lactic acid bacteria are well-established producers of bacteriocins. The protective species identified by Abreu and colleagues, L. sakei, is known to produce several bacteriocins with a wide range of characteristics and putative modes of action, although the best characterized bacteriocin from this species is sakacin. 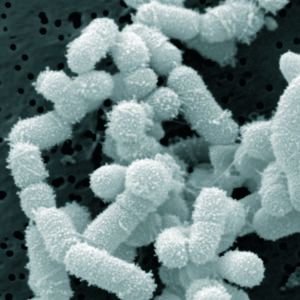 Sakacin has antimicrobial activity against Gram positive taxa, including Listeria spp. and Enterococcus spp., but not Gram-negative bacteria. Other Lactobacillus species that are potential probiotics for the airways act through the production of alternative antimicrobial compounds. 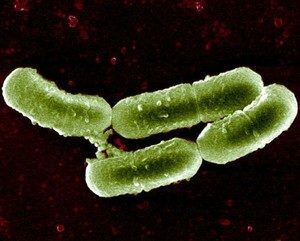 Lactobacillus reuteri produces the protein reuterin, which acts as an antimicrobial compound by inducing oxidative stress in competing bacteria. Reuterin production is increased in the presence of E. coli, suggesting that the effects of this protein are aimed at eliminating competing microbes, giving L. reuteri an advantage in adherence and colonization of host mucosa. Lactobacillus spp. also commonly produce acetic acid and lactic acid, thereby lowering the pH of their niche and inhibiting the growth of acid-intolerant taxa. Finally, probiotic species can compete for growth substrates or receptor binding sites. L. johnsonii competes with several known pathogens for adhesion receptors, which are either glycoproteins or glycolipids. One such receptor is gangliotetraosylceramide (asialo-GM1), a glycolipid that is abundant in pulmonary tissue. Probiotic intervention for respiratory diseases is an area of active investigation, particularly in light of recent microbiome findings. While the field is still relatively nascent, the potential for probiotic manipulation of the sinus microbiome to treat or prevent CRS is great. However, our current understanding of the healthy sinus microbiome and, thus, how best to manipulate it in a disease state are not well defined. Whether to use mixed versus single species and strain inocula, specific species used, mode of delivery, inoculum concentration, and determining the frequency of supplementation are some of the factors that need to be addressed in optimizing probiotic effects. Most of the studies discussed in this article have focused on the gut microbiome and effects at distal sites because these interactions have formed the focus of the majority of stduies to date. However, the murine [mouse] studies discussed here suggest that local administration of probiotics to the sinuses can affect the dynamics of the sinus microbiome. Would L. sakei be beneficial in reducing staph in the nose too? I've had issues with the Rudolph nose syndrome (nasal vestibular furunculosis), in which staph is reponsible for severe pain and redness at the tip of the nose. I've used mupirocin and now I have it again. I feel using this antibiotic is only, in turn, making the staph stronger. I keep having reoccurrences so I am desperate to get this under control. Any info would be great. A common pathogenic bacteria found in sinusitis is Staphylococcus aureus. L. sakei predominates over pathogenic bacteria, which includes S. aureus. Whether it eliminates all strains? - only self-experimentation can answer that. Great 2 minute video on how bacteria evolve antibiotic resistance. Most people with sinusitis have also been reporting to me that they have developed resistance to many antibiotics (typically saying that various antibiotics "don't work anymore"), so it is amazing that L. sakei products work so well in treating sinusitis. Probably worth noting that the Mukerji study (l. rhamnosus) used really small doses, almost ridiculously small. And no doubt as you suggest, other species are required to create a more favorable result. For those interested, the Mukerji et al study mentioned in the article used a "tablet containing 500 million active cells of Lactobacillus rhamnosus R0011 strain". What surprises me is that study after study seems to use only one probiotic species at a time, and it's not clear why one specific species is used over another. And frequently, if there are "negative results", they'll say "probiotics don't work". Eh?? All species are different, and remember that we have multitudes of microbes in our bodies, in numerous microbial communities.